We all have too much on our plates; to the point where we spend our time running around from one thing to the next without truly being in the moment. And because we have so much going on, we tend to overlook our health and well-being in the process. I know for me if I stay up way past my normal bed time I sometimes skip brushing my teeth because I’m too tired and all I want to do is go to sleep. I also seem to pass on meditating more times than not. When I have the thought to do it, I immediately hear an inner voice say “you can do that later…you’ve got too many other things to do right now.” Most times I listen to that voice, thus ignoring the first. Yikes! When said like that, it gives each of these statements a whole new meaning…both of which I know and feel to be false. I do care about my teeth and I do care about my spiritual well-being. This month let’s pay attention to what’s really a priority and what’s really just avoidance in action. Of course this all begs the question…who is this voice and why is it sabotaging us? Maybe we can explore that next month. 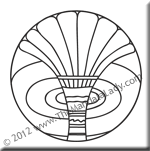 Be sure to download Section 8 of the 2012 Mandala of the Year.